The sixth anime series in the Yu-Gi-Oh! franchise. 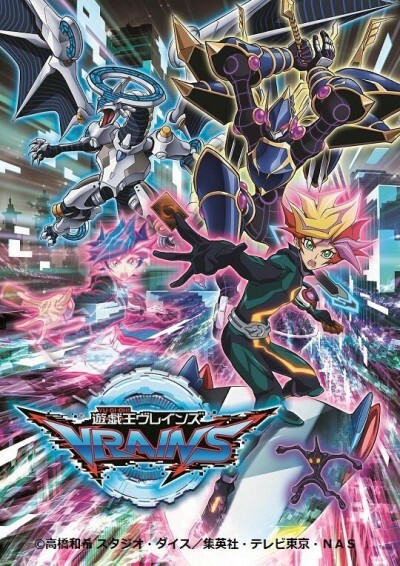 VRAINS is an acronym for "Virtual Reality Artificial Intelligence Network System". In futuristic Den City, people duel using digital cards in the VR space "LINK VRAINS" managed by SOL Technology, Inc. A mysterious organization known as the Knights of Hanoi hacks into LINK VRAINS in search of a runaway AI program, Ignis. One duelist with the username "Playmaker" stands against this threat. His true identity is high school student Yuusaku Fujiki, a skilled hacker with a dark past and a grudge against Hanoi. When he becomes the first to capture Ignis, a struggle between Yuusaku, SOL Technology, and the Knights of Hanoi ensues.